You know that I am no fan of “works for me (N=1), so buy my e-book”-approaches. Until recently, the so-called “Wim Hof Method” was yet exactly that: an N=1 (+ dubious X) approach to health and performance enhancement… and yes, that is “until recently”, or rather “until two years ago”, because two years ago, Matthijs Kox and colleagues from the Nijmegen Institute for Infection, Inflammation and Immunity, the Radboud University (will wonders never cease) the Yale University School of Medicine (Kox. 2014) published a study with the not so telling title “Voluntary activation of the sympathetic nervous system and attenuation of the innate immune response in humans” in the peer-reviewed scientific journal PNAS. The study used a parallel randomized controlled design and was registered at ClinicalTrials.gov as NCT01835457. After approval by the local ethics committee of the Radboud University Nijmegen Medical Centre (CMO 2012/455), 30 healthy, nonsmoking, Dutch male volunteers were included in the trial. Exclusion criteria were: febrile illness during the 2 wk before the endotoxemia experiment, taking any prescription medication, history of spontaneous vagal collapse, practicing or experience with any kind of meditation, or participation in a previous trial where LPS was administered. Table 1: Subject demographic characteristics (Kox. 2014). The subjects were randomly allocated to the trained group (n = 18) or the control group (n = 12) by the opening of a sealed envelope prepared by a research nurse not involved in the study. After having fulfilled the training program, 12 of the 18 trained subjects were randomly assigned to participate in the experimental endotoxemia experiments (see Figure 1). “[…t]his design was chosen to minimize the bias due to differences in the interval between the end of the training period and the endotoxemia experiments. As the aim of [their] study was to investigate the effects of the training intervention on the innate immune response in a standardized model of systemic inflammation, [they] did not assess the effects of the training intervention on immune system parameters in the absence of endotoxemia” (Kox. 2014). A schematic overview of the study design (one block) is depicted in Fig. S3. The trained group was trained by Dutch individual Wim Hof and three trainers who previously received an instructor course by Wim Hof to become a trainer. A medical doctor of the study team (L.T.v.E.) and the principal investigator (M.K.) were present during all training sessions (in Poland and in The Netherlands), and during the experimental endotoxemia experiments. The first 4 d of the training program took place in Poland and were most intensive. What did the program look like? The program consisted of three main elements: meditation, exposure to cold, and breathing techniques. (i) Meditation: so-called “third eye meditation,” a form of meditation including visualizations aimed at total relaxation. (ii) Voluntary cold expo-sure: standing in the snow barefoot for up to 30 min and lying bare chested in the snow for 20 min; daily dipping / swimming in ice-cold water (0–1 °C) for up to several minutes (including complete submersions); and hiking up a snowy mountain (elevation: 1,590 m) bare chested, wearing nothing but shorts and shoes at temperatures ranging from −5 to −12 °C (wind chill: −12 to −27 °C). (iii) Breathing techniques, consisting of two exercises: in the first exercise subjects were asked to hyperventilate for an average of 30 breaths. Subsequently, the subjects exhaled and held their breath for ∼2–3 min (“retention phase”). The duration of breath retention was entirely at the discretion of the subject himself. Breath retention was followed by a deep inhalation breath, that was held for 10 s. Subsequently a new cycle of hyper/hypoventilation began. The second exercise consisted of deep inhalations and exhalations in which every inhalation and exhalation was followed by breath holding for 10 s, during which the subject tightened all his body muscles. These two breathing exercises were also performed during the endotoxemia experiments. Additional element of the training program consisted of strength exercises (e.g., push-ups and yoga balance techniques). After returning from Poland, the subjects practiced the techniques they learned daily by themselves at home (2–3 h/d; cold exposure was achieved through taking cold showers) until the endotoxemia experiment day (5–9 d later). Figure 1: Study design. This block was carried out twice in identical fashion, resulting in 12 subjects in both groups that underwent experimental endotoxemia. CT, control subject; TR, trained subject (Kox. 2014). “[…t]he selected subjects practiced in a final training session led by Wim Hof on the day before the endotoxemia experiment day. Wim Hof was present to coach the subjects during the endotoxemia experiment days during the 3 h that the subjects in the trained group practiced the learned techniques. The control group did not undergo any training procedures throughout the study period” (Kox. 2014). To evaluate the effect of Hof’s method on the subjects’ immune system, the subjects, who had refrained from caffeine- or alcohol-containing substances 24 h before the start of the experiment, and food 10 h before the start of the endotoxemia experiment, were injected purified lipopolysaccharides from Escherichia coli, which were supplied as a lyophilized powder that was reconstituted in 5 mL saline 0.9% for injection and vortex mixed for at least 20 min after reconstitution. Figure 2: Cardiorespiratory parameters, temperature, and symptoms (A-I), as well as plasma cathecholamine concentrations and serum cortisol concentrations during experimental endotoxemia in control (dotted line) and trained (solid line) subjects (J-M | Kox. 2014). “[…a] cannula was placed in an antecubital vein to permit infusion of 0.9% NaCl solution; the subjects received 1.5 L 0.9% NaCl during 1 h starting 1 h before endotoxin infusion (prehydration) as part of our standard endotoxemia protocol (29), followed by 150 mL/h until 6 h after endotoxin infusion and 75 mL/h until the end of the experiment” (Kox. 2016). To estimate the effect of the breathing techniques, the authors measured not just cardiorespiratory parameters, temperature, and symptoms, but also the levels of catecholamines, cortisol and plasma cytokines (stress), as well as the leukocyte count (immune reaction) and conducted correlation analyses of all these variables. Figure 3: Plasma cytokine concentrations during endotoxemia in control and trained subjects. (A, C, E, and G) Median values of pro- (TNF-α, IL-6, and IL-8) and anti-inflammatory (IL-10) cytokines (n = 12 per group). (B, D, F, and H) Median ± interquartile range of area under curve (AUC) of pro- (TNF-α, IL-6, and IL-8) and anti-inflammatory (IL-10) cytokines (n = 12 per group; unit: ×104 pg/mL·h). P values were calculated using Mann–Whitney u tests (Kox. 2014). Figure 3: Correlation analysis (Kox. 2014). significant increases of the anti-inflammatory cytokine IL-10, which correlated strongly with the preceding increase in epinephrine levels (see Figure 3A), as well as significant reductions of the proinflammatory mediators TNF-α, IL-6, and IL-8, which, in turn, correlated negatively with IL-10 levels. In conjunction with the significant reduction of “flu-like symptoms”, the scientists observed in the intervention group, the study at had does therefore in fact “demonstrate that voluntary activation of the sympathetic nervous system results in epinephrine release and subsequent suppression of the innate immune response in humans in vivo” (Kox. 2015). Wow! This really works!? 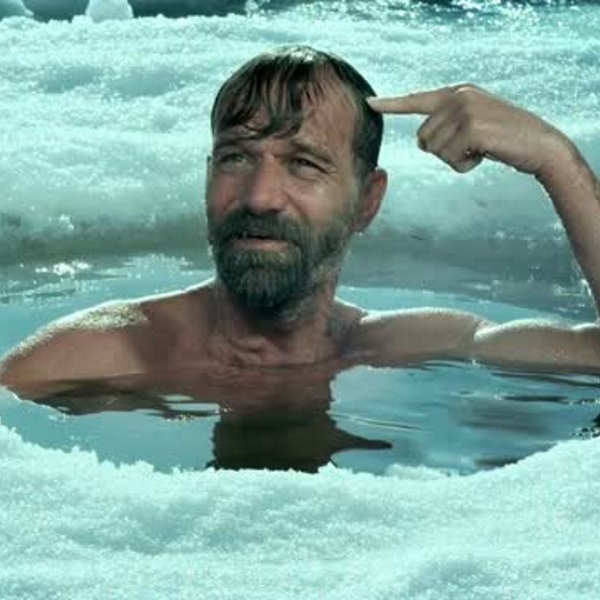 Yes, the study at hand confirms that the long-held theory that both, the autonomic nervous system and innate immune system, cannot be voluntarily influenced must be considered disproven – the “Wim Hof Method”, of which the authors of the present paper highlight that it consists of techniques that can be “learned in a short-term training program” (Kox. 2014) seems to do what scientists have long considered impossible: it allows people like you and me to directly influence their sympathetic nervous system and immune system in a way that triggers highly pronounced increases in the stress hormone epinephrine and down-stream immune effects in form of increases of the production of anti-inflammatory mediators and a subsequent dampening of the proinflammatory cytokine response to an (albeit artificial) immune challenge with bacterial endotoxin. Believe it or not, but an intense workout will have pretty much the same effects on inflammation (in this case triggered by the workout itself) as the “unique” Hof Method (figure from Petersen. 2005; expanded). A study that evaluates the conditioning effect in the same endotoxin model has yet, as far as I know, still to be done. Brandt, Claus, and Bente K. Pedersen. “The role of exercise-induced myokines in muscle homeostasis and the defense against chronic diseases.” BioMed Research International 2010 (2010). Kox, Matthijs, et al. “Voluntary activation of the sympathetic nervous system and attenuation of the innate immune response in humans.” Proceedings of the National Academy of Sciences 111.20 (2014): 7379-7384. Pedersen, Bente Klarlund, and Laurie Hoffman-Goetz. “Exercise and the immune system: regulation, integration, and adaptation.” Physiological reviews 80.3 (2000): 1055-1081. Petersen, Anne Marie W., and Bente Klarlund Pedersen. “The anti-inflammatory effect of exercise.” Journal of applied physiology 98.4 (2005): 1154-1162. Petersen, A., and B. Pedersen. “The role of IL-6 in mediating the anti inflammatory.” J Physiol Pharmacol 57 (2006): 43-51. Van Der Poll, Tom, and Stephen F. Lowry. “Epinephrine inhibits endotoxin-induced IL-1β production: roles of tumor necrosis factor-α and IL-10.” American Journal of Physiology-Regulatory, Integrative and Comparative Physiology 273.6 (1997): R1885-R1890.